Coverage: Live on BBC Radio Wales, BBC Sport website and BBC Sport app. Scarlets' quest for a place in the Pro12 play-offs may be undermined by illness ahead of their crucial match against Glasgow on Saturday. Up to 20 members of the playing squad are suffering with a stomach complaint. 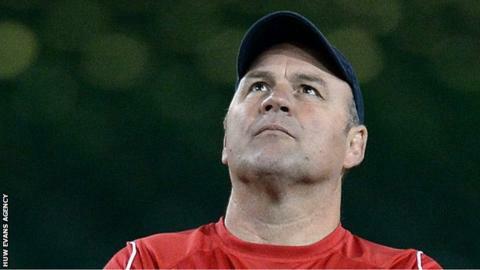 Thursday's training session was cancelled, but Scarlets head coach Wayne Pivac is hopeful the majority of the stricken will recover for kick-off. "We're hoping a lot of those who come tomorrow (Friday) morning will be feeling a lot better," said Pivac. "We've rearranged our day tomorrow to compensate for that and we'll have a bit of a walk-through in the afternoon, and then another walk-through on game day. It's not ideal." The former Fiji coach says he has never experienced such a large number of players being ill at the same time. "It's a first for me, but these things happen and nothing surprises you as a coach when you've been around a while," said the New Zealander. "You've always got to have a Plan B and a Plan C, and that's why we have the larger squads." Scarlets may have to draft in players from lower-tier feeder teams. However, two Welsh Premiership clubs that Scarlets have close ties with are involved in Swalec Cup semi-finals on Saturday, with Carmarthen Quins hosting Cross Keys and Llandovery at Pontypridd. Pivac's men have been in the top four all season, but face a stern challenge from defending champions Glasgow, who have won seven in a row and overtook the Scarlets in third place last weekend.